I love my cast iron. Some of it I’ve had for years. When we used to go camping, there was nothing better than cooking over the fire in my cast iron skillet. Everything tasted…better. Especially breakfast. Maybe it was hunger. Maybe it was sleeping in the fresh air. I personally think it was the seasoned cast iron, or maybe it was the bacon grease. After all, bacon makes everything taste amazing. These days, cast iron cookware can be hard to find. I know I can buy it new online, but a seasoned, well cared for skillet, it’s a treasure. Whenever I go to the flea market, or a yard sale, I keep my eye out for cast iron. You never know when you’ll find a piece for just a few dollars. I grab it up. Even if I already have one the exact same size. After all, I’ve got 3 kids. One day, they’ll move out and need cookware of their own. I’ll want them to have the pleasure of using cast iron too. The great thing about cast iron? You can use it anywhere and everywhere. Camping over an open fire, on the grill, on the stove top and in the oven. Especially in the Oven! Baking in cast iron is the bomb! You treat it just like any other baking dish. Cast iron will bake your cakes evenly. And outside of the cake, the part that touches the pan, it’s delicious! Just as moist as the very center. 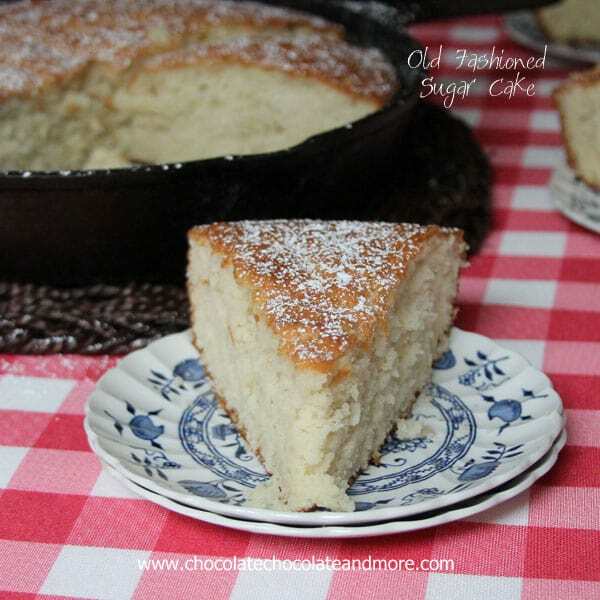 This cake is perfect for baking in a cast iron skillet. I just can’t say enough how amazing this cake is. Made with egg whites only, it’s light like an angel food cake but with a nice crumb. It was melt in your mouth delicious still slightly warm from the oven. But I think it might have been even better the next morning with my coffee. You can also bake this in 10 inch casserole dish or a 10 inch baking pan. I love my cast iron as well but I do not use it nearly enough. I have actually never tried using it for a cake before. I need to attempt this! Looks great! 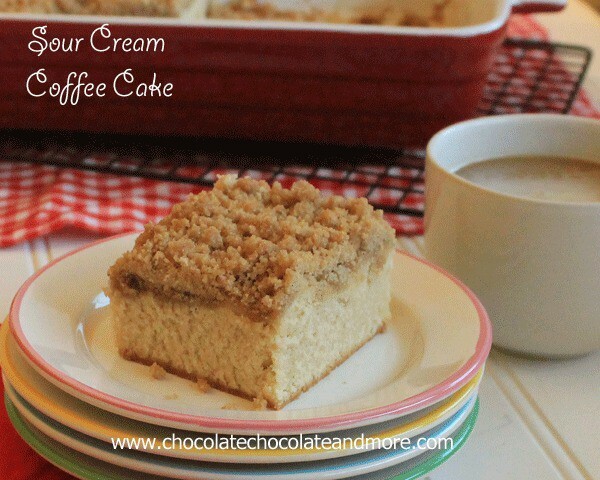 I love baking in a skillet and this cake looks nothing short of amazing! oh my goodness! 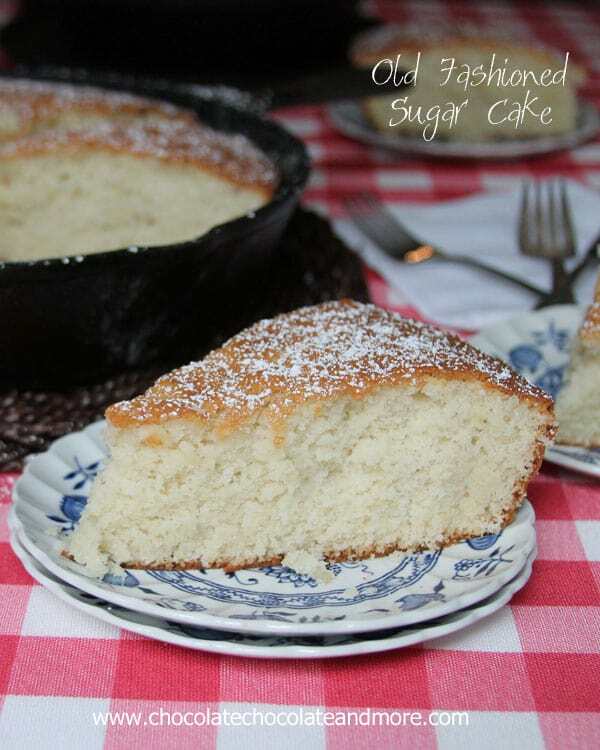 I love that you baked this cake in a cast iron skillet! can’t wait to try this! looks so elegant and delicious! I’ve never heard of a Sugar Cake, Joan, but I sure like the looks of it! Plus, I totally agree, love cooking in cast iron! Pinned! A question….My grand mother made what she called fry bread in a cast iron skillet on the stove. It was a recipe my grand dad had used when he cooked on a chuck wagon as a young man. No one else in the family made it. It was white and had dark spots on it as she turned it like a pancake, but it filled the whole skillet. Is there a receipt for this? I have a friend that used to make Indian Fried Bread, it sounds like what your describing, I’ll see if I can get the recipe from her and post it. I just wanted to share with Bee-Gee I have had fried bread all my life but, we have a very simple way of making it. We just take how ever much flour u want for how much u r wanting to make and add milk or water either one will work. And mix it till u have a batter that looks just like pancake batter then just make it like pancakes. Very simple make sure u have oil in ur pan when frying not a lot but enough to not stick and it helps with the flavor also. Hope u enjoy. I’m not sure if this is what you are talking about, but I have heard it called “fry bread”. We call it “Ho Cake” for some reason. Mix 1 1/2 cups self rising flour with 3/4 cup milk. Scoop out into a plate that is covered with about 1/4 cup flour. Fold over a few times until the dough is not sticky. Flatten out about the size of the plate. Heat an iron skillet and melt about 3 tablespoons of margarine or butter in it. Place dough in skillet, cover and cook over medium heat until brown and crunchy on bottom. Turn to other side and cook. (when I pick it up to turn over, I like to melt more margarine in pan so other side will be crunchy and buttery) When this side is brown, it is ready to eat! I looove cast iron skillets! This cake is so beautiful and simple and I love how delicate and light and perfectly sweet it looks! Oh Joan this looks so good! We love cast iron in this house too! So glad that Grace is doing so well we have been praying for you all. Can real butter be used instead of veg shortning? 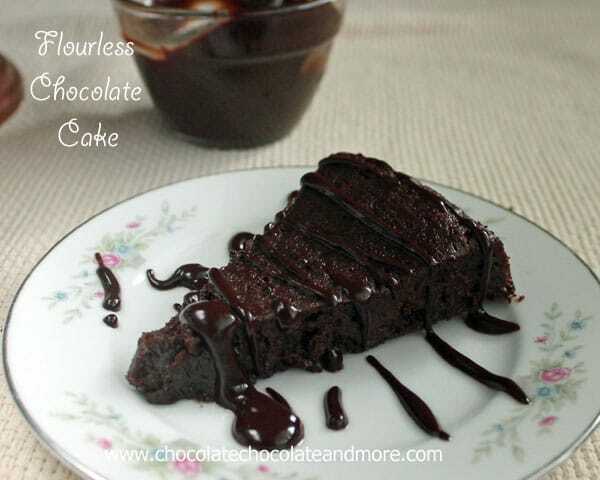 Yes it can but it will change the taste and the texture of the cake. 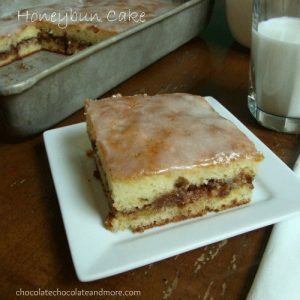 Still yummy but of course you’ll have a buttery taste and your cake will not be as airy and fluffy. Visiting from the “Wake Up Wednesdays” link party. This looks delicious! I’ve never baked in a skillet before. Should the egg whites be beaten stiff before mixing into the batter? That’s what I’ve always done for Angel Food cake. No need to beat the egg whites before adding. I know you normally have to do that for angel food but not for this cake. Enjoy! If there is a Cracker Barrel near you, their store sales the cast iron. I was just thinking I need a cast iron pan! Thank you for the suggestion because there is a Cracker Barrel near me! I suppose their cast iron pan is not “seasoned” as noted earlier. I suppose I have years to season it. I love my cast iron, too, but make sure you do NOT use it on a smooth top/glass top range! Besides the issue of using such a heavy pan on this kind of range (even a very small “drop” could have disastrous consequences! ), cast iron can easily scratch these ranges, and even the oils on the bottom of the pan can damage smooth tops. My glasstop stove is about 15 years old and I have always used my cast iron….of course, I am very careful not to drop it, but have not had any other problems. I use Lodge cast iron on my glass top stove ALL of the time and it’s perfectly fine. In fact, in my manual it even says it’s okay. As long as the bottom is flat and you’re careful moving it around you should be fine. 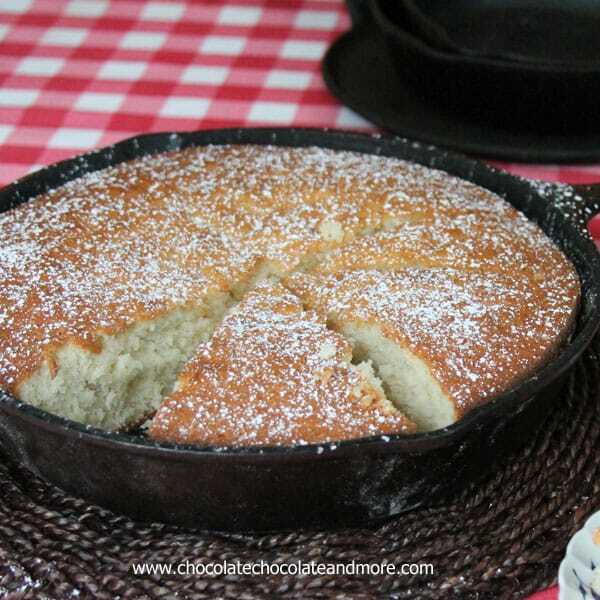 It cooks amazing, even on glass top…………I would never give up my cast iron!!! I love how simple this is and would go great with any flavor of ice cream! I made this tonight, and it was wonderful. I wanted a light cake to make a summer time dessert, and this fit the bill perfectly. I topped it with a Lemon curd/mascarpone/whipped cream concoction that was really REALLY good, and some fresh blueberries to serve after a fancy pants dinner and it got rave reviews. Thank you for the recipe. A true keeper! So glad you enjoyed it, I love the whipped lemon curd and blueberry additions, the perfect complement to this cake! 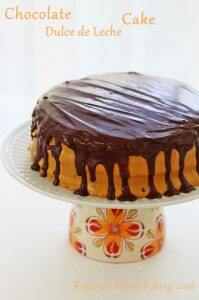 I want to make this cake as a sort of sponge cake for my shortcakes but I don’t have a cast iron pan. Could you suggest any other pan in the place of the cast iron? You an make this in either a 9 inch cake pan or use a round casserole dish. I just made this tonight. It was so good! Tasted kinda like a cake donut or a funnel cake with the powdered sugar on top. Turned out perfectly in the cast iron. I was afraid it would stick but it didn’t at all! So glad you enjoyed it. Cast Iron is amazing to bake in! Love my cast irons skillets. I have no idea how old they are. They make the best pineapple upside down cake ever because you can caramelize the sugars before you pour in the batter. This is the way my Grandma made hers. 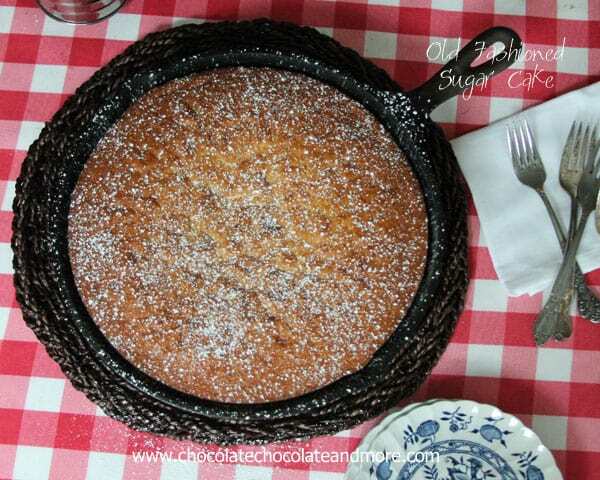 Will try your sugar cake, looks yummy. Has anybody cooked this in a baking pan? Any advice for giving a baking pan a try? Thanks! I’ve also made it in a 9 inch round cake pan, it works just fine. You can turn it out onto a cake plate to serve if you like. Hi. Do I grease the baking pan? Yes, grease and flour your baking pan. Can this be made using whole eggs instead of egg whites? Yes it can but using the egg yolks will make a denser cake. Hi Joan. Can I use “egg beaters” egg whites? I’ve never used Egg Beaters but I don’t see why not if they will froth up like regular egg whites. So glad you’re enjoying it. It’s one of my favorites! thoughts on adding choc chips? I don’t have a cast iron skillet. 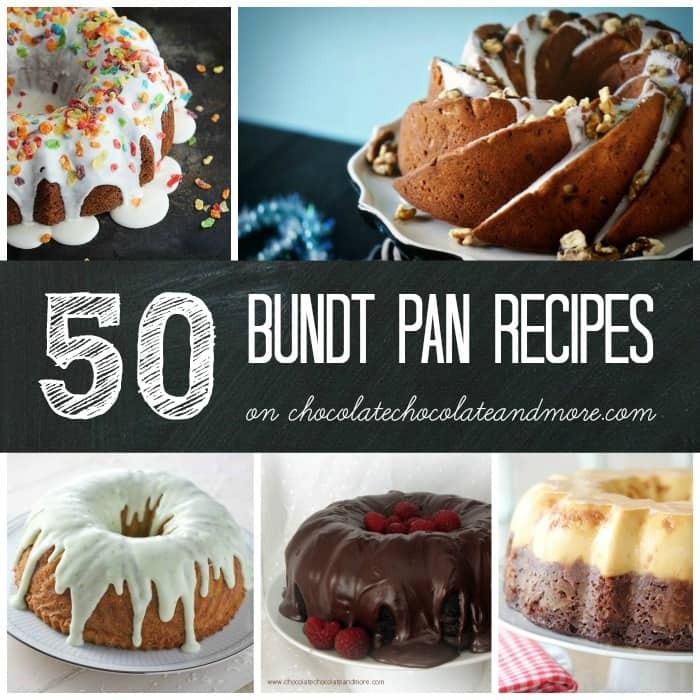 Could a cake pan be used instead? This looks delicious!! Yes, you can use a 9 inch cake pan. Just an FYI….Cracker Barrel carries a nice line of cast iron cook and bakeware . Hi there, my question is about the flour. Is the extra 2 T supposed to go in the batter or is it for flouring the pan? The 2 Tablespoons of flour goes in the batter with the 2 cups. Although my skillet hasn’t seen cornbread for at least 30 years, my cake had the cornbread consistency and even a bit of a taste of it. It’s also crunchy with sugar. Should I have creamed the sugar & shortening (actually, I used butter), vs. milk & shortening. Did I not blend it long enough? 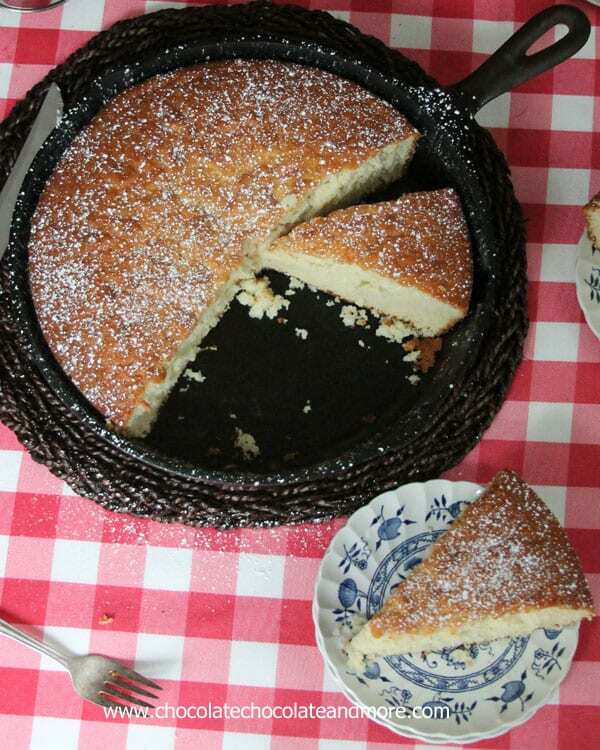 Sounds like you might need to re-season your skillet if your cake tasted like cornbread. As for the consistency, this cake should be light and airy, even using butter instead of the shortening. I just made this cake and it reminded me of cornbread, too. I did not care for it but my husband did. I just took this beautiful cake out of my oven and my whole house smells like heaven! Everybody’s mouths are watering while we wait for it to cool. I know this will be a go to for simple elegance in any situation. p.s. smells like my beautiful grandma’s house…thanks! Hi! I was wondering – can I make this as cupcakes? I’m making some things for a bake sale and want to use this recipe but wanted to do cupcakes. Thanks! Sure you can make cupcakes, I’d start checking them at about 20-25 minutes, use a toothpick to test for doneness. do the egg whites need to be beaten and fluffy before you add them to the rest of the batter? No need to beat the egg whites before adding to the batter. Just add them last. Cake looks amazing…am trying it out now, I am using real butter but just wanted to know for future reference, would oil work? Also, you don’t beat the egg whites first, right? Cake turned out beautifully! So moist and delicious! Disappeared in minutes! If you were cooking this while camping, could you cover with tin foil over fire? Or bake uncovered in a propane grill? How long would you cook it? This would be a great addition to our camping recipes!!! I’m not a camper so not sure what to tell you although I have seen some great cakes made in a dutch oven over an open fire. I don’t have a cast iron skillet. 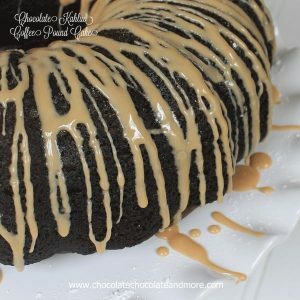 What can I use to make this cake? 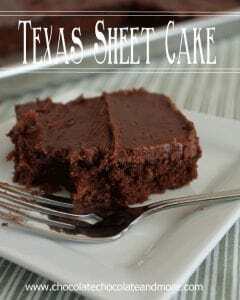 You can make this in a 9 inch cake pan (as long as it has tall (2 inch) sides or in a casserole dish. This was delicious, thank you! Tender and light, perfect crust. I do love cast iron! I hadn’t worked much with shortening before, and the milk was splashing everywhere, so I “tented” my mixing bowl while creaming the milk/shortening. 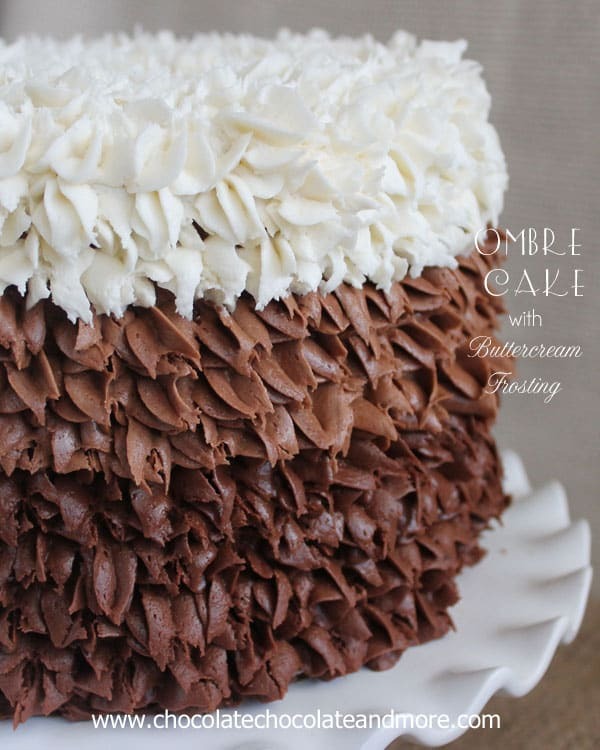 I’m going to try flavoring this cake as many ways as I can: spice, cocoa, almond, liqueurs…..this seems like a really versatile cake! All those flavors sound great! 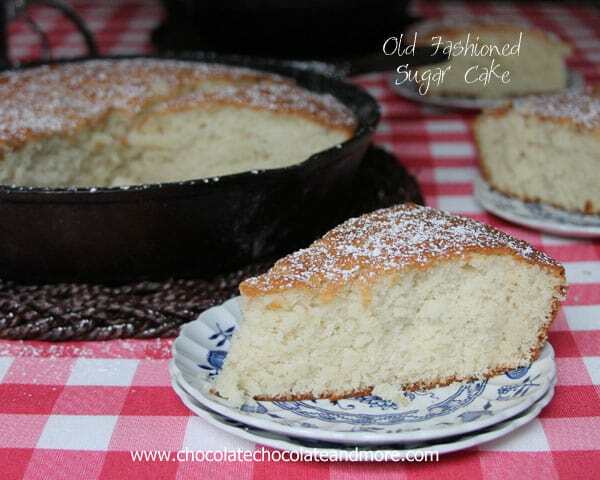 This is one of my favorite cakes just because it’s made in a cast iron skillet! This cake looks great and I can’t wait to try it, but what really caught my eye are your plates. This is the same pattern of my grandmother’s dishes. I was wondering if you know the maker and/or the pattern. I would really love to get a few pieces of my own. Glad you like the cake. As for the plates, I found them at a flea market, a great find! They are Blue Fiord Ironstone from Wood & Sons, England. Hope you have luck finding some of your own. I have been thinking of baking this cake for months and I finally did it. It was amazing with strawberries and whipped topping. It was so fun baking it in my new oven and my cast iron skillet. I am going to make this a tradition every strawberry season and I am going to call it grandma’s old fashioned sugar cake. I have 5 little grandchildren and I want them to remember their grandma’s wonderful cake. Thanks for this recipe. Sounds like a great tradition to start and will provide beautiful memories for your grandkids! I leave the cake in the skillet to cool. If serving it warm, you do need to be careful not to touch the hot skillet or it could burn you. Do you beat egg whites first? No, you don’t beat the egg whites first. Just add them as you would full eggs (whites and yolk) to the cake batter. Enjoy!